I was told that Jerusalem artichokes were so easy to grow that it’d be hard to get rid of them once they went into the ground. “They’ll spread like weeds”, said the old bloke on the plot next door. I dug the tubers in early one morning, the ground wet and the mist clinging tightly to the handle of the spade as its blade cut through the cold earth, little jewels slowly disappearing in perfectly spaced formation under the surface. I expected success, but I got nothing. I later wrote the words ‘Jerusalem artichoke’ on the bottom of the long list of ‘Things That Failed, Failed Badly’ underneath peas, beetroot and sweetcorn. Just another nail in the coffin of my allotmenteering career. Don’t let this sorry tale of horticultural disaster put you off Jerusalem artichokes, although I’d understand if it put you off the idea of keeping an allotment. Jerusalem artichokes, however, are superb – nutty, earthy and substantial, they give a stew or a pie a certain backbone and a unique taste, almost peat-like. They’re strange little vegetables, all mis-shapen and inelegant, difficult and fiddly to peel and quick to discolour. They have nothing at all to do with Jerusalem, and aren’t artichokes at all – they’re actually the tuber from a species of sunflower. Pairing Jerusalem artichokes with chicken is a very good idea, and this Sophie Grigson pie does exactly that. 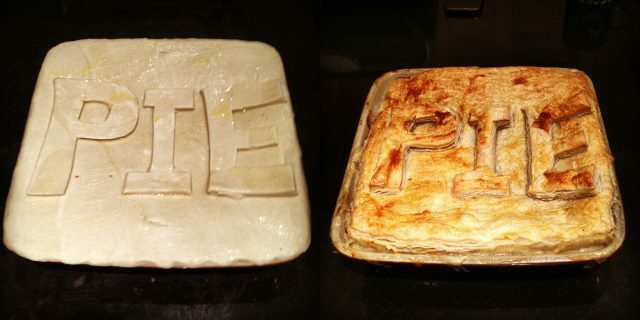 It’s become a regular fixture in our kitchen because it’s easy to put together, can be prepared in advance and because the filling freezes reasonably well, so there’s a fantastic pie on hand at all times bar an overnight defrost. Finely chop an onion and a couple of cloves of garlic, and sweat them gently in some butter. The onions shouldn’t colour. Add half a kilo of peeled and roughly chopped Jerusalem artichokes to the pan, with the grated zest of an orange and a generous glass of white wine. Crank up the heat and let the wine evaporate until it barely remains. Now start to make the base for a thick sauce by adding two and a half tablespoons of flour and stirring it in so that it’s evenly distributed. 300ml of chicken stock, ladled in slowly finishes the sauce – it just needs salt and plenty of ground black pepper. Add 700g of diced chicken … I’d use thigh meat in preference to breast, here, and everywhere else, for that matter … cover the pan and let the filling simmer very gently for ten minutes. Watch that the sauce doesn’t catch on the bottom of the pan. Take the lid off the pan, add 150ml of double cream and continue to simmer for another five minutes. Pour the filling into a fairly big ovenproof dish, roll out a block of puff pastry until it’s thin, but a little thicker than you think it really should be, lay it over the pie, crimp it to the edges of the dish and trim the excess. Brush with beaten egg, cut an air vent in the middle and bake at 220c for fifteen minutes, then at 190c for another twenty-five. Serve on a wet weekend afternoon, the type where condensation forms on the kitchen window and everybody is tired and a bit grumpy. This will sort that out.